In 1946, Willi Fels donated some 400 of his most valuable pre-1801 printed books to the University of Otago. Many of these books carried German or Italian imprints. 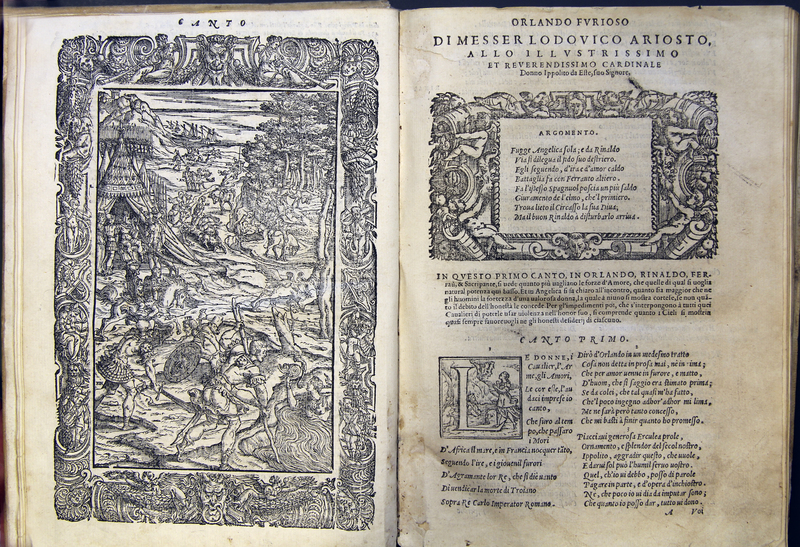 One work he gave was Ludovico Ariosto’s epic poem Orlando Furioso (The Frenzy of Orlando), printed in Venice in 1556. This chivalric romance is set in the time of Charlemagne’s Christian knights warring against the Saracen army. The poem contains 46 cantos and he used ottava rima, the famed ‘abababcc’ rhyming scheme. Not only was the work immensely successful, but this particular edition represents one of the high points of 16th century Italian illustrated books. Ludovico Ariosto, “Orlando Furioso,” ourheritage.ac.nz | OUR Heritage, accessed April 26, 2019, http://ourheritage.ac.nz/items/show/11176.